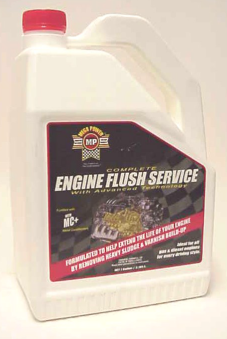 The safe engine flush product and method from Mega Power. Now on sale. this easy flush out your motor method is better because your motor also gets friction reducing - one of the anti-wear ingredients that cleans and frees sticky piston rings and engine valves while removing sludge. Most engine flushing methods are better harmful to your motor. Not this one. It includes a friction reducing an anti-wear advantage your dirty engine really needs other motor flush products do not have. Some car motor’s blowby volume in the crankcase is excessive or the removal is slow and engine sludge results. Directions for the Mega Power Engine Flush Service. Drain oil from engine and remove old oil filter. Replace oil drain plug and install new filter. Shut off engine and drain contents of crankcase. Replace oil drain plug and replace filter again. Add new motor oil as per manufacturers specification and check oil level. Stop any leaks. * On larger capacity engines, it may necessary to add additional oil. Ratio of 25 to 50% Mega Power to oil so there is 50% oil present in large engines with this product. Small engine can run with just this product in place of oil for 5 minutes idling. Add #95 Mega Power Engine Treatment and #75 Mega Power Worn Motor Treatment to the new oil . If a 3 to 10 gallon oil capacity, add One gallon Mega Power Oil Treatment. plus additional oil. Ratio of 25 to 50% Mega Power to oil so there is 50% oil present in large engines with this product for 5 minutes idling. Small engine can run with just this product in place of oil for 5 minutes idling. Order his product Now! Special 2 and 4 gallon deal. Shipped to your door by FedEx in about 3 days with easy to follow directions. Free phone help. Guarantee. 2 gallons just $48 includes shipping. Order 10 cases - 40 items, just $48 per case of 4. $58 plus $10 s&h= $58 total per case. Times 10 cases = $580 total. For resale, suggest $50 per flush labor plus oil and filters. These special ends when sold out! Blowby creates sludge. Your motor needs blowby reducing help, if you read this far. We'll show you how to flush-out its sludge and end blowby properly. And have a better running motor than you hoped for. About Blowby. Blowby refers to that portion of your motor's combustion that slips past your motor's pistons - instead of pushing your pistons down fully for needed power. See picture below. Our engine flush product, a "treatment," ends blowby and has several advantages why we say it will restore your motor's like new power. You will be amazed such a product actualy exist - and is what your motor needs right now! 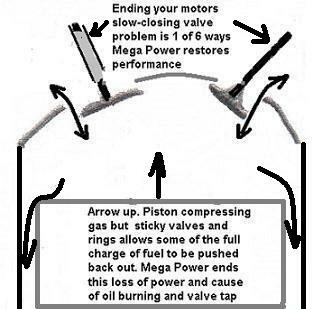 While I drew this picture to show why your valves tap and your motor looses power, or burns oil, notice the two arrows going around and down pass the piston - that is your motor's blowby problem, that our way to flush out your motor ends for you! With a sealed crankcase - every crankcase section of every motor needs to vent that hot nasty, acid loaded blowby, and un-burnt gas or diesel fuel out of that section of your motor. Or it will blow out the motor's gaskets and seals - and dump your motor oil all over the road. The vent system on your motor is called the "positive crankcase ventilation system." It has a thumb size valve with a ball bearing in it that moves by the force of engine suction, draw blowby out of the crankcase as your drive. That oily, acidic fumes is then emptied into your motor's air intake system - mixed with income fuel, and burnt during combustion. Besides the making of sludge - which gums up every piston bearing valve and gear - you now note it is also gumming up your motors throttle, idle adjuster, top piston rings, fuel injectors, spark plugs, and catalytic converter mufflers. So, besides sludge screwing up your motor from blowby, the re-circulation and re-burning of blowby also creates an upper system dirty flair of stickiness. If your motor has sludge and an oil leak, blowby is is cause of it. Why old fashion motor flushes are harmful - Click the buttons on the left that list a problem - besides sludge, to find your remedy.